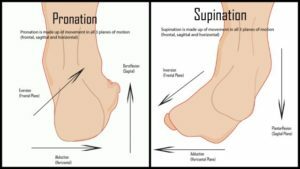 Pronation occurs as weight is being transferred from the heel to the forefoot when walking or running, this is done to help with shock absorption, produce strength to push off during the gait cycle and also help with balance to adjust to different terrains. Pronation is natural in everyone but in some cases the foot can roll in too much or in other words over pronate. This can therefore put increased stress on the muscles, tendons and ligaments in the foot or lower limb. Over pronation can be seen when standing and also when observing the gait cycle.